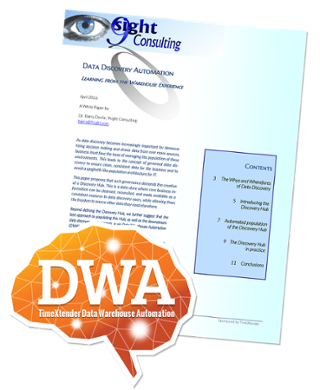 Have you seen the new white paper by Data Warehousing expert Barry Devlin? "As data discovery becomes increasingly important for democratizing decision making and draws data from ever more sources, business must face the issue of managing the population of these environments. This leads to the concept of governed data discovery to ensure clean, consistent data for the business and to avoid a spaghetti-like population architecture for IT. "This paper proposes that such governance demands the creation of a Discovery Hub. This is a data store where core business information can be cleansed, reconciled, and made available as a consistent resource to data discovery users, while allowing them the freedom to source other data they need elsewhere. "Beyond defining the Discovery Hub, we further suggest that the best approach to populating this Hub, as well as the downstream data discovery environments, is via Data Warehouse Automation (DWA) approaches and tools." Click here to download a copy of the white paper.